Mark Gardener gets back on the road with his pioneering shoegaze band, Ride. Thursday, Sept. 21, 8 p.m. When a classic band reforms, they run the risk of tarnishing the group's legacy—and Mark Gardener knows it. "We were all very aware that if we came back and it wasn't very good," he says from his home in Oxford, England, "we wouldn't be doing ourselves any favors." For Gardener, it also wouldn't have been enough to get back with his friends in the seminal shoegaze band, Ride, and run through the old songs on a kick of nostalgia. The music had to be fresh and exciting. As it turns out, the frontman was motivated by the prospect of running out of time. "You feel immortal in your early 20s," he says. "Then you get older and you start losing people around you who were very close, and you realize how mortal we all are. [The band] ended so strangely, and I think we all felt there was a lot of unfinished business. I always believed we could make another great record because the chemistry has always been great between us. If we didn't end up making the album we did, personally I think it would have haunted me for the rest of my life." 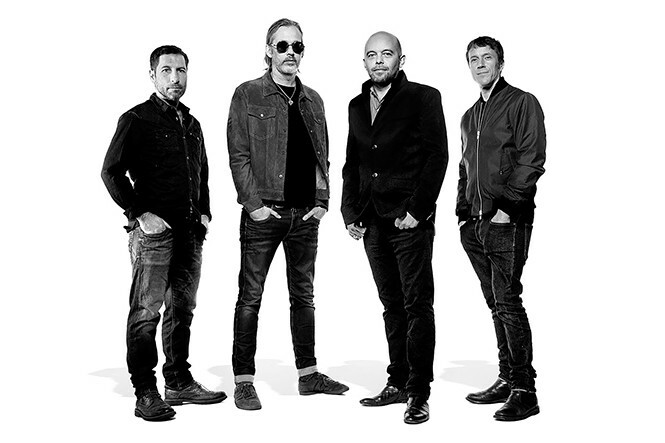 Ride officially reformed in 2015 for a run of live shows, then went into the studio to, well, finish business. The product is Weather Diaries (Wichita), released in June. As the band's first record since splitting more than 20 years ago, it features many of the airy soundscapes, amplified textures and Beach Boys-esque vocal harmonies that defined the group's early work, but it's firmly rooted in the present thanks to glossy modern production. Weather Diaries, like the band's entire catalogue, is driven by the experimental guitar work of Gardener and fellow singer-guitarist Andy Bell. That raises another reason Gardener wanted to get the band back together: He's consistently underwhelmed by today's guitar music. "A lot of the bigger acts have gotten a bit bland, really," he says. "Ride can be really weird, but it also has this sort of pop element, and hopefully it's, you know, interesting." The group formed in 1988 and released Nowhere (1990) and Going Blank Again (1992) on the cult U.K. indie label Creation Records. Unlike most other records associated with the shoegaze scene, the albums became both critically and commercially successful. More than a quarter-century later, the LPs have aged well. Last year, Pitchfork ranked them third and fifth, respectively, on its list of The 50 Best Shoegaze Albums of All Time. Slowdive's Souvlaki (1993) ranked second and My Bloody Valentine's Isn't Anything (1988) and Loveless (1991) landed at fourth and first—making the entire Top 5 Creation Records releases. Gardener still bristles slightly when Ride is classified as shoegaze. After all, when the British press slapped that label on early '90s bands that spent most of their stage time staring down at their kicks and effects pedals, it wasn't a compliment. "We had a lot of praise and a lot of critics," he says. "But at the end of the day, the harshest critics were ourselves." Indeed, creative tensions arose and the band fell apart during the recording of universally panned Tarantula (1996). "The first time around obviously ended up being a bit of a car crash," Gardener says. "We all needed a good time away from the band, because for a time it was all that we knew." Following the well-publicized breakup, members of the band scattered. Bell played bass for Oasis and its offshoot Beady Eye. Gardener initially played in short-lived band The Animalhouse with Ride drummer Loz Colbert, then moved to France to pursue a number of solo projects, collaborations (Goldrush, Brian Jonestown Massacre) and production work (Swervedriver, BJM). Since reforming, they've discovered there are certain advantages to being older and more experienced. Back in the day, Ride's live shows were messy and exciting, but hit-and-miss, Gardener says as the band prepares for a seven-date U.S. tour. They've all since grown into steadier players, singers and friends. "I've never been satisfied with what we've done in the past, and maybe I never will be," he says. "But it feels good to be back with these guys and playing the music we're playing." Gardener never anticipated the band's music would appreciate over time. "In the beginning, we were totally content to be in a room together making a real racket," he says, adding they had no conception that it would do well. "But it feels great to know it's sort of made its mark and it's in the books—that our music will always have some sort of place."